So I finally got to see Taylor Swift live last night at Hyde Park British Summer Time as part of her 1989 World Tour. Having missed her previous two tours due to educational obligations, I was extremely excited for this one, yet slightly anxious, given the 'festival' format rather than an arena setting. Openers Rae Morris, Vance Joy, John Newman and Ellie Goulding slowly worked up the crowd but the full power of the Swift crowd was not felt until the moment Swift stepped on stage and belted out 'Welcome to New York'. 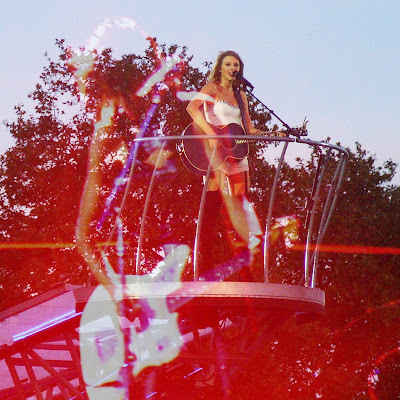 The 1989 London Tour featured all her new tracks from the album apart from 'Wonderland' and reworked versions of 'I Knew You Were Trouble', 'We are Never Ever Getting Back Together' and 'Love Story'. Highlights of the night include Swift's alien piano, an extractable spinning crane and guests Serena Williams, Cara Delevingne, Karlie Kloss walking down the runway to 'Style'. Closing the show with 'Out of the Woods' was perfection, whilst the encore being the predictable yet adrenaline pumped 'Shake It Off' left everyone leaving on a high. Two fans who we met were not wrong when they said Swift concerts were amazing. This was an unforgettable evening and I am sure to be attending her next tour.